Is it cheaper to pay a toll to drive on Interstate 66 during the rush hour or cheaper to ride public transit? That’s the question that some commuters are weighing since tolling began four weeks ago. 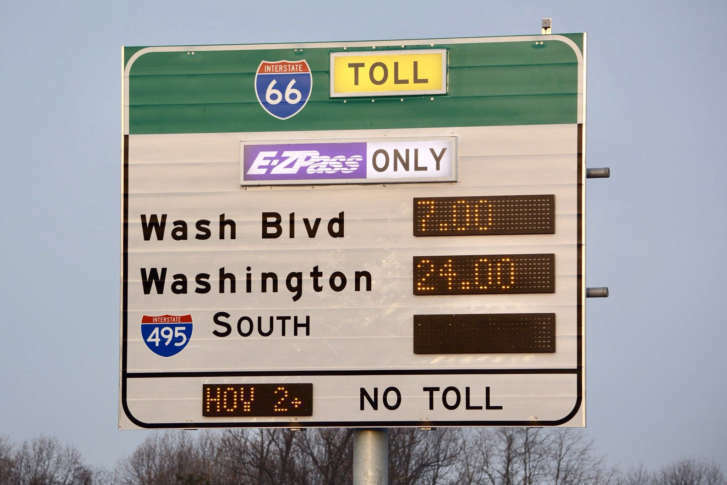 WASHINGTON — Is it cheaper to pay a toll to drive on Interstate 66 during the rush hour or cheaper to ride public transit? That’s the question that some commuters are weighing since tolling began four weeks ago. Commuter Debbie Vickers did the math. She could pay $18 a day to ride the commuter bus from the South Riding area to Downtown D.C.
Or, she could pay a few dollars less per day to take the bus to the Wiehle-Reston East Metro Station and then ride the Silver Line into town. Or she could hit the road at 4:45 a.m. to use I-66 before the HOV restrictions start and pay $10 in tolls during her evening trip home to Loudoun County. “I had to give myself a limit,” Vickers said. At $10 a day, “that’s even $50 a week. So that’s $200 a month extra. That’s my cap, $200 a month for tolls that I didn’t used to have to pay because I had a hybrid,” Vickers said. As a hybrid driver, Vickers had been able to legally use I-66 inside the Capital Beltway since 2004. Before then, she routinely faced two-hour commutes. Now, she is preparing for that reality again. “I’m willing to get up early,” she said. “It’s the evenings — I can’t get around without paying the tolls. I know they will go up,” she said. Virginia officials have said the tolls and longer HOV hours are intended to move more people along the I-66 corridor through carpooling and transit. But so far, commuters have resisted parking their cars with many willing to pay the tolls, according to a WTOP survey of 1,030 commuters. The online, nonscientific survey was conducted from Dec. 14 to 18. Few commuters said they are opting to ride Metro in lieu of carpooling or paying the tolls. Metro reported no change in ridership at Virginia Orange and Silver line stations since the tolls began on Dec. 4. Nearly an equal number of commuters said they were driving alone and paying the toll as those who chose to ride HOV, according to the survey results. However, the largest portion of commuters — nearly a third — said they found alternate options to avoid the tolls including taking side streets or riding VRE. Some said they were splitting their commute, like Vickers, and paying the toll one way and finding another route or carpooling for their reverse trip. About a fifth of commuters said they were leaving earlier and the remainder said they were opting to leave later, take Metro or ride a commuter bus. Nicholas Ramfos, director of Commuter Connections, said that paying the toll might make sense for occasional I-66 users. But transit or carpooling is cheaper overall for daily commuting. HOV commuter Krista Shonk agreed with Ramfos. “Carpooling has proven to be a more efficient and more comfortable way of commuting for us. We’re able to split the cost of commuting and it’s actually a lot cheaper for us,” Shonk said. Shonk shares a carpool with two other women from Vienna to D.C. every day. She used to ride Metro until about two years ago. Revenue from the tolls is slated to help increase the slate of alternatives available to commuters like Vickers. An initial $10 million has paid for new park-and-ride lots, express bus service and even incentives to help commuters find carpools or slug lines. More projects are slated to roll out in the coming months. Find tips for successful carpooling from Commuter Connections here.